Summerhallare giving away two pairs of tickets for this unique arts event. One set of tickets for Friday night and one for Saturday! This Weekend! Get Lucky? To win a pair of tickets simply answer this question: Nile has recently collaborated with a French duo resulting in a No.1 hit, who are the duo? Enter below. 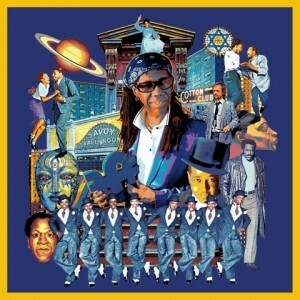 Summerhall is very excited to announce that over two nights on the 21st and 22nd June we play host to music legend Nile Rodgers for ‘Indigo Night’, a unique collaboration between Rodgers and Belgian artist, Jean Pierre Muller. Nile Rodgers has written more hit songs than you can believe, and his impact on popular music of the last forty years is inestimable. Classics include Chic singles like Le Freak and Good Times, and his collaborations take in the likes of David Bowie (for Let’s Dance), Sister Sledge (for He’s the Greatest Dancer and others), and this year’s biggest selling single so far, Daft Punk’s Get Lucky. The event – featuring spoken word, visual art, and music – is a world premiere, and an important development of the major 7×7 project shown to acclaim during the Summerhall 2012 Festival. 7×7 is a cross-arts collaboration between neo-pop artist Muller and seven musical luminaries – Nile Rodgers, Robert Wyatt, Mulatu Astatke, Archie Shepp, Sean O’Hagan, Kassin and Terry Riley. To WIN Tickets please state whether you’d prefer a ticket for Friday or Saturday. Enter your answer and contact details in the Leave a Reply section below. Both sets of winners will be drawn and announced on Friday 12 o’clock! Get Lucky!